Ian Burke will be in action for Corofin in Sunday week's Connacht final. ALL-STAR WINNING FORWARD Ian Burke will bolster the options of All-Ireland club champions Corofin by being fit for selection for Sunday week’s AIB Connacht decider. Burke, who collected his first All-Star award recently after his exploits for Galway this summer, has missed Corofin’s last two games after fracturing a rib in their drawn county final. He watched on as Corofin completed six-in-a-row in Galway with a replay victory over Mountbellew-Moylough and then dismantled Roscommon’s Clann na nGael in last Sunday’s Connacht semi-final. “It’s fine, I’ll be 100% now for the next day. I fractured a rib in the semi-final, so missed the last two games (and) had to rest, that’s all you can do really with it. “I played the first game but didn’t really realise the extent of the injury and then got the scan on the Monday after and then realised it was fractured. I just had to rest it really for the last two games. Corofin will be bidding for three-in-a-row in Connacht on 25 November when they take on Mayo’s Ballintubber, in what will be their fifth successive season contesting the final in the western province. Burke has been part of a golden run of success that has also yielded two St Patrick’s Day triumphs in Croke Park. His return enhances the scoring potential of a team that amassed 4-22 last weekend in Dr Hyde Park but he’s simply relieved to have an opportunity to make his mark after watching Corofin chisel out a draw in injury-time of the county final. “The first day we were very lucky,” says Burke. “Fair play to (Mícheál) Lundy (who scored the levelling point), the rest of them as well, they dug out the draw. “Got a goal early on the second day which gave us a bit of a platform to build on. Still lucky to be still here I suppose. “(Clann na nGael) winning in Roscommon, beating the likes of Brigid’s, we played them a lot lately and had great battles with them. Corofin and Galway’s Ian Burke is pictured ahead of the AIB GAA Connacht senior football championship final where they face Ballintubber on Sunday 25 November. AIB is in its 28th season sponsoring the GAA Club Championship and will celebrate their 6th season sponsoring the Camogie Association. 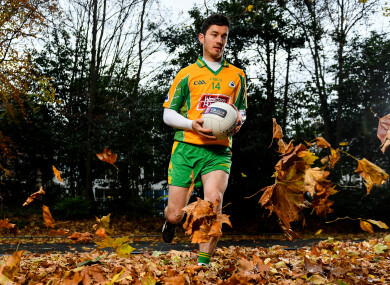 Email “Boost for All-Ireland champs Corofin as All-Star forward available for Connacht decider”. Feedback on “Boost for All-Ireland champs Corofin as All-Star forward available for Connacht decider”.